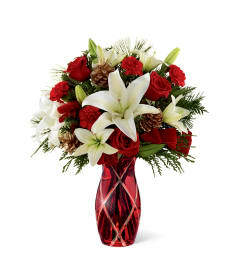 The FTD® Holiday Cheer™ Bouquet is blooming with Christmas charm to send your warmest season's greetings to friends and family near and far! Rich red roses, red spray roses, red mini carnations, white chrysanthemums, variegated holly and an assortment of holiday greens are brought together to create a beautiful holiday flower arrangement. 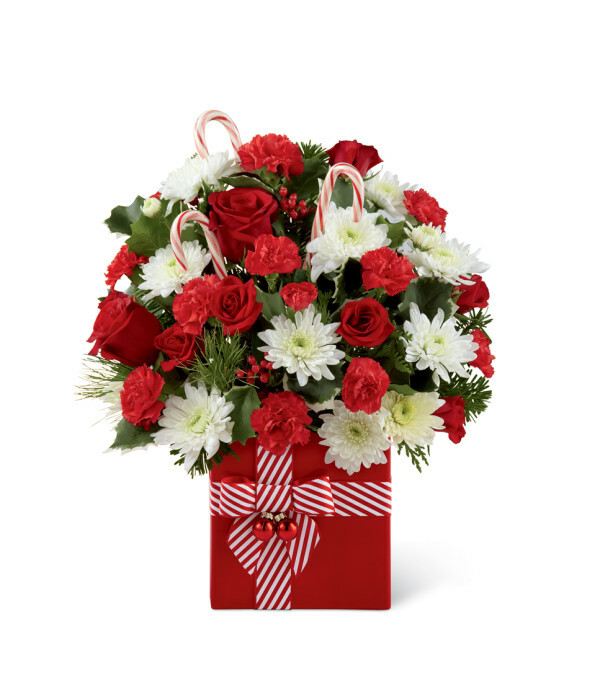 Presented in a bright red ceramic square vase tied with a red and white striped decorative bow to mimic the look of a wrapped present, this mixed flower bouquet is cheerfully accented with candy canes to bring joy and holiday splendor to their Christmas season.